Sir Richard Branson once said, "We (Virgin) look at markets where things have been done the same way for a long time and we ask whether we can do anything different.". 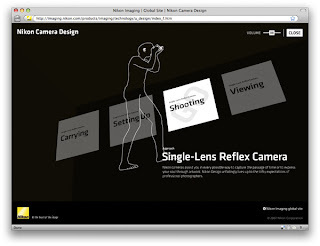 After searching for even a hint of a Camera industry online strategy I'm coming up with nothing. It appears to be 90% retail/product sites, 9% un-sponsored community, and 1% larger channel promotions or presence. I'm in no position whatsover to judge, this might be the most reasonable approach for these products - but I can say that it's all rather dull. And an upstart Camera company could make a killing just by harnassing the tools online. I almost gave up looking, and looked to the FWA as a last ditch effort and found the following microsite. 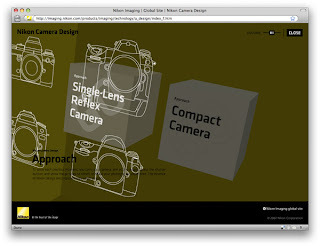 I had looked all over the Nikon company site and had found no doorway to this, or at least completely missed it. I hate that I have to go to the FWA to find something interesting a company has done. The imagery appears crude at first, but an atmosphere is created using an interesting blend of voice talent and background music. And once you start exploring, the motion only adds to the atmosphere creating something that feels more like a video game interface than a menu for videos. 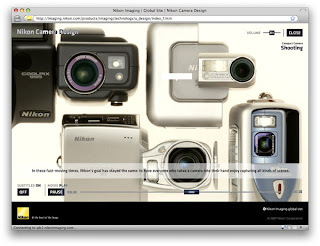 Video content is the core of the site, full-screen of course. But the videos were built into the site, rather than housed by the site. It's great when the content in a site feels at home rather than placed in a "bucket".